Russian President Dmitry Medvedev delivered a speech to the participants of the Yaroslavl Forum in which he laid out five universal standards of modern-day democracy. Dmitry Medvedev started his speech at the forum with the minute of silence to honor the victims of Thursday’s deadly blast in the country’s North Caucasus region. Moving through on his agenda, President Medvedev went down to the core topic of the Forum and shared his ideas on democracy, not only as a political form of rule, but as a lifestyle. “I believe in democracy, not only as a form of government and political regime, but I also believe that democracy is only thing that can deliver millions of people in our country and billions of people in the world from indignity and poverty,” the president said. According to Medvedev having more and more countries in the world follow the standards of democracy is one of the Russia’s priorities. The president said that, just as it is with human rights, the standards of democracy should be universally acknowledged and only that would make them effective. “Jointly developed standards cannot be based on duplicity, cannot be sly, because everyone who would apply them is taking part in creating them,” President asserted. “Along with fair criticism, which we hear quite regularly and which we take quite positively, we sometimes have to deal with unjust and very biased assessments of our political system,” noted the Russian leader. Medvedev stressed that Russia is definitely a democratic country and that he can never agree with those who accuse Russia of authoritarian policies. 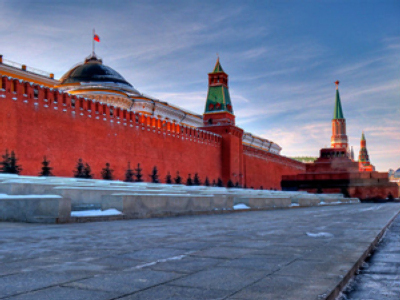 “I strongly disagree with those who claim there is no democracy in Russia; that authoritarian tendencies prevail here. There is democracy in Russia. It’s immature, it’s imperfect, it’s inexperienced, but it’s democracy nonetheless. We have a lot to work on but we are free,” he insisted. However, democracy is not only about freedom, it is also about self-restraint, the President added. In the light of all said, Dmitry Medvedev suggested his vision of universal standards for democracy and outlined five key criteria that should be met by a 21st century state. “That means that all those values we believe in must be legally framed,” the President said. This is needed to guarantee the practical power of law is imprinted on these values that will set the guiding line of social development, the president explained. According to Medvedev, a 21st century state must achieve and support a high level of technological development. “Stimulating scientific research and innovations, in the end, produces enough public benefits to achieve a decent quality of life,” Medvedev said. Speaking about living standards, the President emphasized that poverty is one of the main threats to democracy. “It’s obvious that a poor person can’t be free,” he stated. Modern technology, and modernization in general, are a vital issue for Russia’s development, and this is widely understood, the Russian president said. “Modernization of the economy and technology has been among our top priorities; I announced this new course a year ago and it was met with the total support of all political and public bodies. Nobody questions the necessity of modernization, I have never heard a political party say ‘we are against it, we would like to preserve everything as is’. The argument is all about institutions, possibilities, about the speed of development,” he said. The President returned to the burning topic of countering the world terrorism movement he touched upon earlier in his speech. In this criteria Medvedev outlined “the possibility of a democratic state to protect citizens from criminal communities,” such as terrorism, drug trafficking and illegal migration. 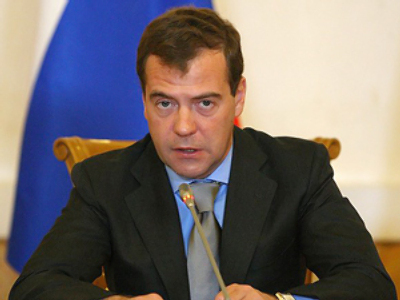 “The elimination of these threats is the first task of a democratic society,” Medvedev said. Democracy as a form of government must fully implement its policy functions, the president said, and went on to quote the European Security Charter of OSCE, which calls for the creation of political and legal conditions that will allow police to carry out their mission according to democratic principals and support independent judicial authority. “All this fully corresponds with Russia’s approach,” the president observed. “The more educated a person is, the more independent he is,” he said, explaining the main idea of this principal. The President then talked about the importance of modern-day technologies in the educational process, specifically the Internet. He pointed out the importance of public discussions on all pressing issues: here, he said, modern technology, including the Internet, could be and should be of great help. Today, Medvedev said, informal Internet polls already provide public opinion on issues of utmost importance; sooner or later, the Internet will become a fully legitimate public opinion source. 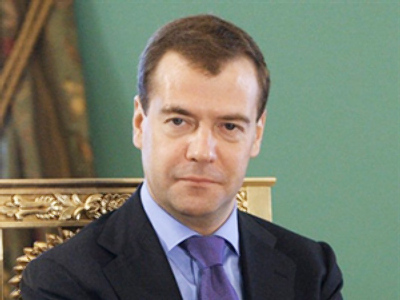 Democracy only begins when a citizen tells himself he is free, Medvedev said, emphasizing the role of Russians in building democracy in the country. “The governments can repeat many times to the people that they are free, but democracy begins when a citizen tells himself: I am free,” Medvedev said. According to Medvedev, it is a typically Russian feature to look up to authority. “I have already pointed out as a major malady the so-called paternalist moods, so widespread in Russia, confidence that someone should solve your problems for you. 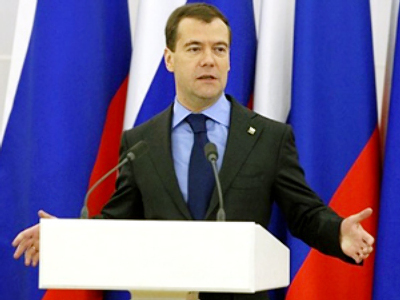 This frequently pushes us back [in development] very strongly,” Medvedev told his international audience. “Even in our times, many of our people like to say that they are not free, humiliated that nothing depends on them. Such a position can be convenient: if there is nothing you can do, there is nothing you are responsible for – regarding not only the state, but even your family. This is a very convenient, but a very dangerous position,” he said. Luckily, Medvedev said, a growing number of Russians are adopting a different way of thinking, and rely not just on the state, but on themselves. “This means, democracy has a chance in our country, and in the world,” he said. While addressing the Forum participants, Dmitry Medvedev reminded the audience of this summer’s abnormal heat, which resulted in massive wildfires in Russia, seeing it as proof that only new technology can help humans resist the forces of nature. Medvedev also took the chance to thank Italy’s Prime Minister Silvio Berlusconi and South Korea’s President Lee Myung-bak for their countries’ help in fighting the fires.